We offer two sizes of plant trailers – one narrower, one wider – to make sure that you can get your machines to where they need to go. The trailers have a 2 tonne capacity to ensure that your 1/1.5t excavators, 80 rollers and 1/1.5t dumpers can be moved without spending extra on lorry hire. We have plenty stocked and ready to go – along with the associated pins and ratchet straps you need to be secure, so whether you’re hiring one of our machines or moving your own equipment, you can rest easy knowing that you can get where you need to be. 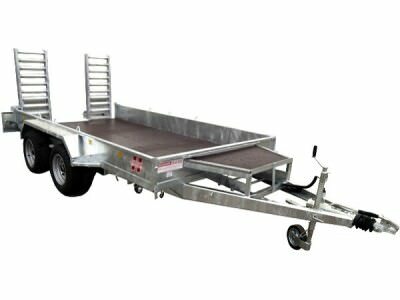 Plant trailer with a pin hitch, ideal for moving small plant machines. 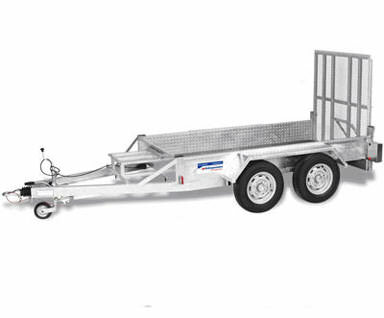 These trailers are perfect for moving machines such as mini excavators, dumpers and rollers. Makes moving between jobs easy.